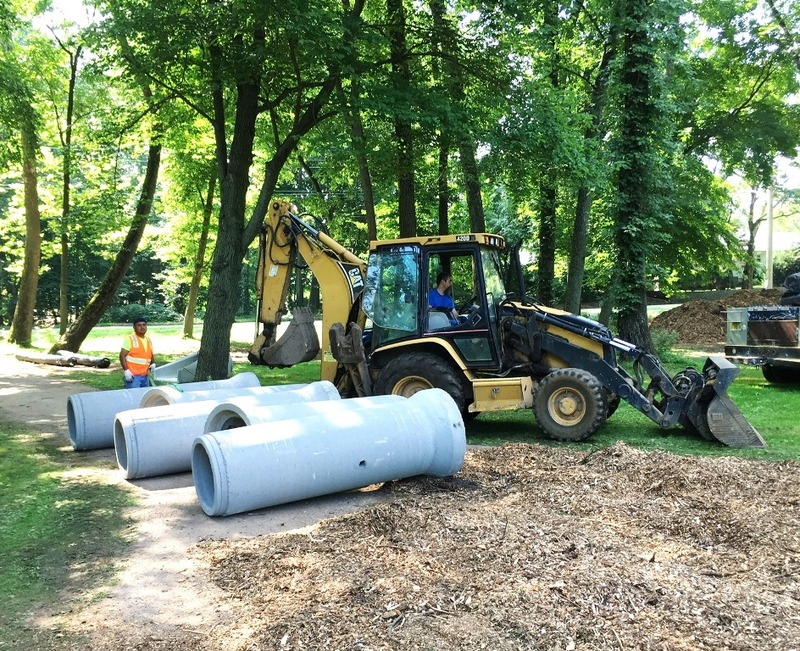 Union County, NJ – The Union County Board of Freeholders is pleased to announce that the County has begun to dredge and make additional improvements to the Meisel Park Pond at Meisel Park in Springfield. The work involves dredging Meisel Park Pond and replacing the old outlet structure and piping. The new concrete outlet structure is designed to be easier to clean and less prone to clogging, and an electric aerator will be installed to increase dissolved oxygen in the pond. Dissolved oxygen is necessary for aquatic life and is one of the key measures of a healthy body of water. The shoreline will also be rehabilitated and improved with native plants to help reduce excess nutrient runoff into the pond. The new plants will also attract butterflies and other important pollinators. Weather permitting, the entire project is expected to be completed this fall. Meisel Park is part of the Union County parks system. It is located off Meisel Avenue in Springfield. The dredging project is being conducted by Grade Construction of Paterson, under a contract of $841,730 awarded by the Freeholder Board last November. For more information about activities in Union County Parks visit ucnj.org/parks. Quick links to all Union County programs related to open space, the environment and sustainability are available at The Green Connection, ucnj.org/green-connect. Photo: The pond at Union County’s Meisel Park in Springfield has been temporarily transformed into a worksite as crews conduct dredging and other major improvements. With completion expected this fall, the project will create a healthier aquatic habitat and a more pleasant environment for park visitors. Credit: Jeffrey Jotz/County of Union.